APPETIZER An easy way to treat your guests to a delicious and elegant hors d’oeuvre, perfect for the holidays or any occasion! Remove bacon from package and cut bacon slices in half. Wrap a slice of bacon around the scallop and place seam down on an ungreased cookie sheet. Repeat until all scallops are wrapped. Bake for approximately 20 minutes or until bacon is crisp. 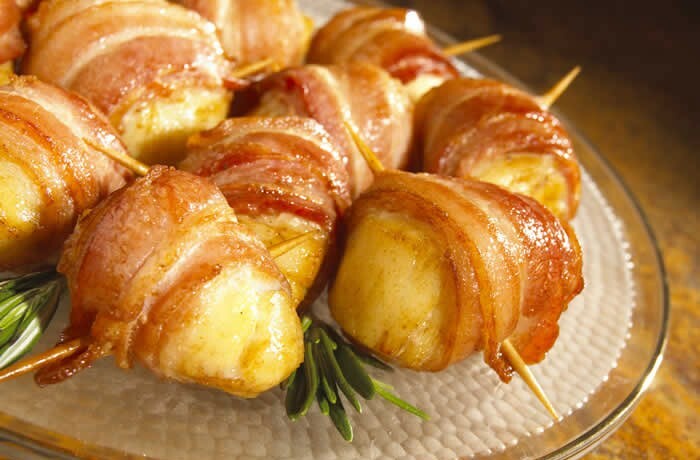 Insert a toothpick into each bacon wrap and serve with lemon, spicy mayo or chili sauce. Note: For a change of pace, try wrapping other favorites such as dates or water chestnuts.